Photos catching Mr. Nimoy leaving his hotel at Zimbio. 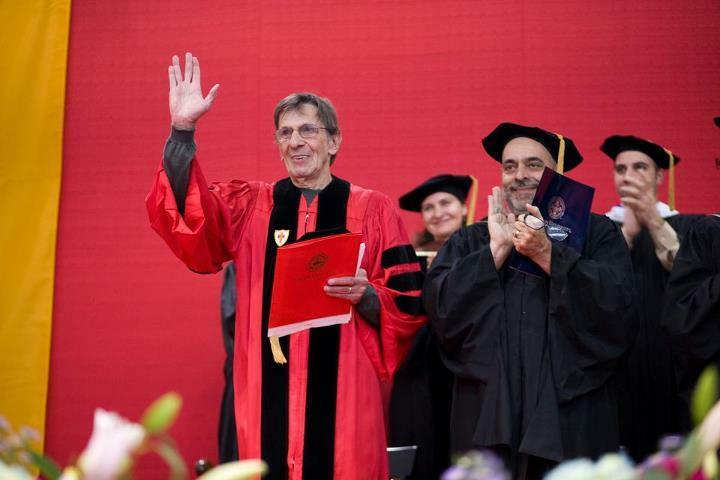 Leonard Nimoy will receive a Doctor of Humane Letters degree from Boston University on Sunday, May 20. As is Boston University’s tradition, the names of the Commencement Speaker and honored guests were announced on May 3 during the annual Senior Breakfast. Eric E. Schmidt, executive chairman of Google, will deliver the University’s 139th Commencement address. The Honorable Sandra L. Lynch, chief judge of the United States Court of Appeals for the First Circuit, will speak at the Baccalaureate Service. Others who will receive honorary degrees are: Norman R. Augustine, retired chairman and CEO of Lockheed Martin; Thomas G. Kelley, retired Massachusetts Secretary of Veterans’ Services; and Leonard S. Nimoy, acclaimed actor, director, recording artist, author, and photographer. Family and friends not able to be at Nickerson Field can still watch the Commencement ceremony including the commencement address and awarding of honorary degrees via live webcast or listen to the ceremony locally on Boston radio station WBUR 90.9FM. More at Trek Movie here and here with more photos from the event and clips with interviews on the red carpet and at Film Review Online and here at Exposay. Nimoy said he didn't feel qualified to speak to the merits of the president's new plan for space, but that it sounded like a positive direction. "All-in-all I'm looking forward," he said. "I hope it's going to work out for the best." Nimoy said he has followed space exploration throughout his career, and remembers driving to work on the set of Star Trek when he heard the news of the Challenger accident. "Those pictures will never go away," he said of his memories of the explosion replays. It's just beginning to sink in that the space shuttle era is ending, Nimoy said. The original Spock (aka ‘Spock Prime’), Leonard Nimoy is returning to his home town of Boston this weekend to attend The New England Fan Experience. And Boston is so proud of their native son, that they are declaring Saturday (November 14th) "Leonard Nimoy Day". Visitors to the Science Museum in Boston might remember him from the introduction to the sound system of the museums IMAX/Mugar Omni Theater in the '80. Untitled from Recumbent Goat on Vimeo. The Boston Phoenix runs a piece called "Hardly Illogical: Leonard Nimoy Day, November 14". Commenting on Boston's policy in those matters they remark on a acerbic note: "it should be pointed out that this city has a bizarre habit of handing these things out like they were free samples of organic cookies." The award is named after actor Leonard Nimoy, best known for his iconic portrayal of Mr. Spock in the television and film series, Star Trek. The Leonard Nimoy Angel is an award bestowed on individuals and/or organizations that have made significant contributions to theater in Los Angeles, and to Company of Angels, in particular. Nimoy will be recognized for his role as a founding member of the theater company. Also to be honored will be veteran actor RobertEllenstein, for his contribution as the company's first Artistic Director. "I'm looking forward to celebrating Company of Angels 50th Anniversary Award Ceremony and Gala," said Nimoy. "My congratulations for so many years of good work!" The Award Gala is produced by actress Marlene Forte who sits on the board of CoA as Artistic Director. Marlene Forte was recently seen on the big screen beaming people away as the first Latina Chief Transporter in JJ Abrams’ blockbuster film 'Star Trek'. For photos of Leonard Nimoy arriving at the Company of Angels Awards go to Accidental Sexiness. and there is also a report at Trek Today. I found two new photos from the festivities at Tex[t]-Mex Gallery here and here. "The Julie Award is bestowed for universal achievement spanning multiple genres, selected each year for our esteemed panel of industry professionals." See Daily Dragon Online for more. 35th Annual Saturn Awards - Press Room June 24, 2009 - Burbank, CA. + here and here. Plus more photos of the event at Trek Movie here and here. "Q. In the new film, when you appear on screen, especially when we see your face for the first time, a noise goes up from the audience. Have you sat with an audience to watch the movie; if so, how gratifying was that experience and how do you interpret it? A. Extremely gratifying. It’s an accumulation of emotion from a 44-year relationship with the audience. Especially pleasing since Spock was marginalized by the makers of the movies and series that followed the first six." In his gracious heartfelt acceptance speech, Nimoy revealed that one of his first films was in the science fiction genre. He was certain it would launch his career into orbit. Sadly, "Zombies of the Stratosphere" apparently barely had the legs to reach the atmosphere. One of Nimoy's lessons from this was to aim higher -- In Zombies, he had played the second Zombie in the door. In the future, Nimoy would aim to be the first zombie or alien. . . .
NEWS FLASH: Leonard Nimoy might never have played Spock in the Star Trek movies were it not for Katzenberg's vision, drive determination and ability to beg when necessary. Paramount was developing the first Star Trek movie when Katzenberg was an executive at the Studio. He knew Nimoy considered his vulcan days a thing of the past having previously turned down any Star Trek overtures. Nevertheless, Katzenberg made a pilgrimmage to Broadway on behalf of Paramount, Star Fleet Command and fans everywhere. 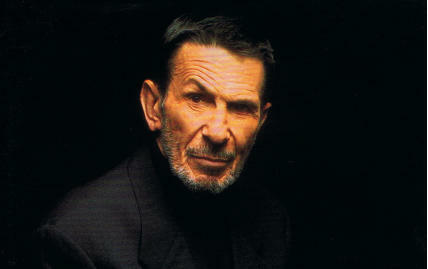 Nimoy was performing in Equus, playing Dysart, a psychiatrist treating a troubled young man who had blinded six horses. Katzenberg watched Nimoy's brilliant performance and must have realized Nimoy was in an alternate galaxy from Vulcan. At that point, I imagine Jeffrey wished James Doohan (Scotty) could just "beam Nimoy back to Paramount." When Katzenberg bravely went where no other Paramount executive had dared to go -- backstage to see Leonard Nimoy, he must have felt he was crossing his own final frontier with no special effects for protection..
Of course, Jeffrey Katzenberg possessed something better than special effects -- persistence and a good pair of knees. He literally got down on his knees to beg Nimoy to put back on those pointy ears. 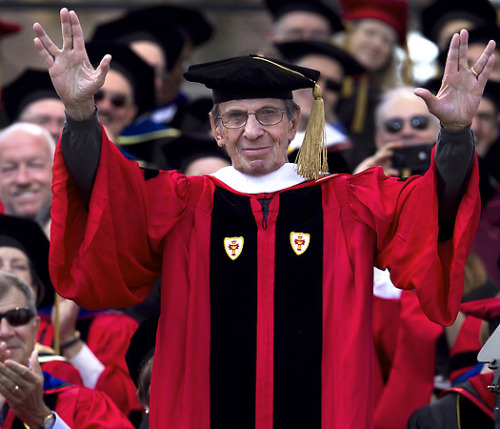 "Leonard Nimoy was the graduation speaker for Brooks Institute December 2009 graduation class. During this event he was awarded the Honorary Master of Fine Art degree from Brooks Institute for his contribution to the photographic world. His graduation speech was inspirational and gave the graduates and attendees insight into his vision of what he sees through the lens." Nimoy's search for knowledge in general prompted him to enroll recently in a graduate studies program at Antioch College, where he's in education. "Once I get it," he says, "I'm not going to do anything with it at all. I'm not interested in the degree itself; I'm curious about what will happen to me during the process. of getting it." "Like I said, I lead a pretty bourgois life, and I'm always interested in expanding my mind, finding new values. I want to see what will happen to my head during the 15 months it'll take me to complete the project. I don't know where it'll lead me. Maybe," Nimoy says, "I'll find out what I should be when I grow up." In this interview Mr. Nimoy describes the day the envelope with the notification from the Academy of Television Arts and Sciences arrived.